My son's thirteenth birthday was back in January but I completely forgot to post about his cake! Jake went totally bonkers over it and said it was the best birthday cake I have ever made for him. Sometimes it's the simple recipes that make the biggest impression. It's a fairly easy cake to make, both kid and adult friendly, and, because it's cake mix based, it's doesn't take very long to prepare. To save a little money and to keep from having a big package of Oreos in the house (big temptation for me), I used one 8oz package of Mini Oreos instead of 18 full size cookies. The little cookies also came in handy for decorating the cake too. The frosting was almost too good to be true; super creamy, chocolaty but not too much, and complimented the flavor of the Oreos perfectly. Preheat the oven to 350F. 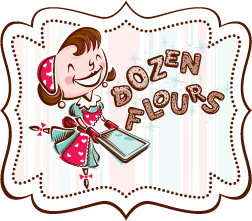 Spray two 9" cake pans with Pam for baking or grease with shortening and dust evenly with flour, tapping out the excess. Set the pans aside. Grind the cookies in a food processor and process them until you have a fine crumb. If you don't have a food processor, you can put the cookies in a zip-lock style bag, squeeze all the air out, and crush them using the bottom of pot or a rolling pin. You'll need 2 1/4 cups of crumbs total. If you have more than this, set them aside to use to decorate the cake (if desired). Set aside. Place the cake mix, water, eggs, and oil in a large mixing bowl and mix on low speed for 1 minute and scrape the bowl and blade. Increase the speed to medium and mix for another 2 minutes and scrape the bowl and blade. The batter should look evenly colored. Add the cookie crumbs and mix on low for 15 seconds or so until all the crumbs look evenly distributed. Pour the batter evenly between the two pans and smooth the tops. Bake both pans in the oven, side by side, and bake about 25-30 minutes until a cake tester in the center of the cake comes out clean. Remove the cakes from the oven and cool on wire racks for 10 minutes. Run a knife around the edge of the pans and invert onto the rack. Then invert each cake again so they continue to cool right-side-up. Allow to cook completely 30 minutes more. Place the cocoa powder in the mixing bowl of your stand mixer and pour the boiling water over it. Stir the cocoa and water with wooden spoon or rubber spatula until it comes together to create a soft mass. Add the butter and blend on low with the paddle attachment on low speed until the mixture is smooth and well combined, about 30 seconds. Add the vanilla and salt and mix for 30 more seconds. Scrape the bowl and blade. Add 1 cup of powdered sugar and beat on low speed until all the sugar is incorporated. Repeat with the other 2 cups. Scape bowl and blade. Increase the speed to medium and beat until the frosting has lightened in color and is fluffy, about 2 minutes more. Add more boiling water, a teaspoon at a time, or more powdered sugar, a tablespoon at a time, if the frosting is too thick or too thin. Slice each cake horizontally (if desired) so you have 4 layers of cake (I like to do this using a long piece of unflavored dental floss). 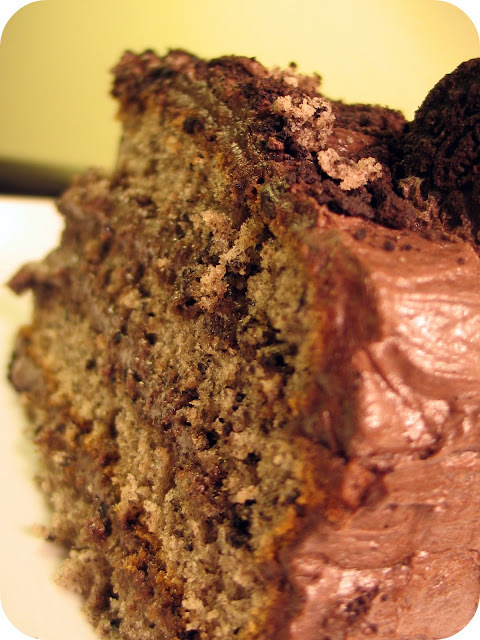 Place a little bit of frosting on the bottom of your cake plate (this will act like glue and hold the cake in place). Place one of the cake slices cut side up on the plate. Top with some frosting and smooth to about 1/2 from the edge. Repeat the process with the remaining 3 layers. Then frost the top and side of the cake. 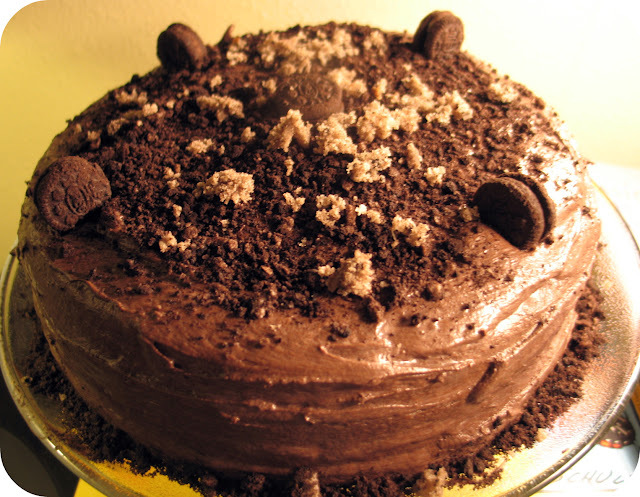 Decorate the cake with reserved cookies, cookie crumbs, and cake crumbs or any way you wish. Cut and serve right away or let it sit at room temperature until you're ready to eat. Good Lord I am ready to dig in with a big 'ol glass of milk nearby! I'm dangerous with a bag of Oreo's as well ;-) Hey! I see "me" on your sidebar!! I love you man!! Julia- That looks gorgeous, I am thinking on making this for my stepdaughters birthday. That looks great! I loved cake mix adapted recipes, easy and usually delicious! Thanks! Happy birthday Jake!!! Hope he had a great one. Did you try the cake yourself Julia? If you did (I know you're not a fan of chocolate)and loved it then I know this is one I need to try. Happy belated bday to Jake! No wonder he enjoyed this cake--it looks totallly awesome. You've put all of my favorite things into one cake. I'm sooo impressed. Man oh man, I wish I could have a slice right now! mmm..this does look like the best cake ever! That looks amazing Julia! It sounds like a cake version of cookies and cream. I hope Jake had a wonderful birthday! It's no wonder this cake was his favorite, heck it's my favorite and I didn't even have a piece!! I've left you something on my blog! Just out of curiosity, why do you use oil instead of butter for the cake? Ingrid - I have to be honest, I didn't have any. Not because it didn't look or smell good, but because I was trying to be good. It was tempting though! Jake did say he liked the frosting a lot because it wasn't too fudgy but it was just chocolaty enough. Hi A_and_N! Welcome and thank you! Regarding your question about why I used oil instead of butter? Great Questions! Well, here's the thing: This cake is made with a cake mix and cake mix contains dried milk or milk solids. Since butter contains about 80% oil and 20% milk solids, I was worried that by using butter and changing the ratio of milk solids, it would create a cake that was too dense and dry. I could have used clarified butter instead of the oil but I didn't think it was worth the effort. For cakes that don't include cake mix as one of the ingredients, I almost always use unsalted butter (I once used olive oil in a cake and it was AMAZING!) so this is not the norm for me. The cakes looks delicious. My husband would love it and he's birthday is right around the corner. Thanks for the idea. Sadly, my cake looks nothing like yours lol I'm new to this baking thing. Thank God I have time before my boyfriend's birthday to perfect it.